Call for larger capacities that are not listed for online purchase. We can build them to order as needed. If you are looking for smaller lower capacity load cells (5, 10 and 50 kg) please take a look at our RES2 S-Beam Jr. load cells. If you need a S-Beam load cell for For-Trade applicatoins i.e. packaging products to be sold on the basis of weight, then you need an NTEP certified load cell. Check out our RRS1 NTEP Certified S-Beam Load Cell for your applicattion. Non-Linearity from 0.02% of full scale. S-Beam load cells (or S beam Load cells, so named for their distinctive S shape,) are one of the most versatile load cells available in the market and offer the best solution for applications that need both tension and compression force measurement. They are most often found in applications such as cable strength testing, harness testing and rip strength of cords, ropes and wires. The RAS1 is made from tool steel and is available in capacities from as little as 25 lb. up to 25,000 lb. This load cell has very good accuracy, stability and easy mounting features especially for in-line tension testing applications where two threaded rod-ends or eye bolts can be easily attached to the threaded female holes on the two ends of the S-Beam load cell. 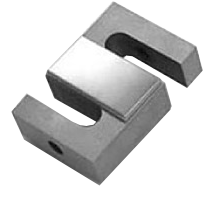 These S-beam load cells are available in 25 lb to 25,000 lb capacities. If you are looking for smaller lower capacity load cells, please take a look at our RES2 S-Beam Jr. load cells. If you are going to use this load cell in tension, you might be interested in the following option.